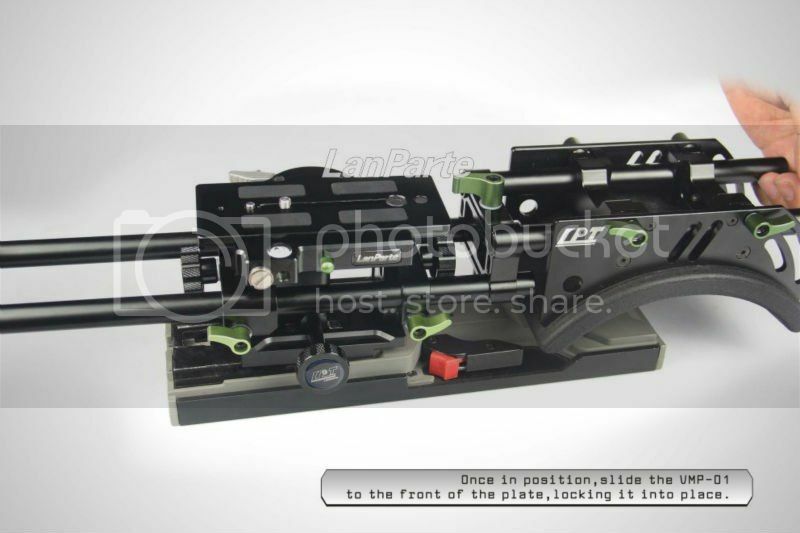 The new Lanparte VMP-01 DSLR and Camera Baseplate is a unique item on the market. It features a real quick release system that allows you to pull away the camera top wise. Moreover it is fully height-adjustable and can be mounted directly on any VCT-14-style tripod adapter plate. The new VMP-01 Baseplate has a patented system with a real quick release plate which allows you to pull away the camera from the top. No need to slide forth or backwards, this means that you gain not only time, but also space because you don't need to watch out to leave enough space around the camera plate. The new design comes with a height adjustment screw. On the bottom of the bridgeplate you will find two screw threads in 1/4" and 3/8", but the bottom is also shaped to allow you to mount it directly to a VCT-14-style tripod adapter.